I am not sure an introduction is needed. If you are interested in food in Nottingham you won’t have been able to avoid the column inches devoted to this restaurant. Alex Bond is an ambitious chef who, having worked at Sat Bains (amongst other top establishments including El Bulli, the pinnacle of the world food scene for probably a decade) now has his name above the door of his own venture. That door is on Derby Road and it creeps up on you with little outside signage or fanfare. The space is quite impressive, a large exposed brick room that is naturally sectioned by arches with sunshine streaming from the hidden skylights. The decoration is sparse but it doesn’t feel too empty, walls of moss that stretch from floor to ceiling are unique and attractive. The entry could do with a more obvious “reception” but other than that I really enjoyed the contemporary style. There is also a little bar area that presumably you can enjoy a pre-dinner drink or coffee in but we were immediately ushered to our table. There are 3 menus, a five (£35), seven (£45) and ten course (£60) though the shortest of those is only available at lunch. The differences between the seven and ten were impressive with only 2 common dishes, it would be easier for the kitchen to overlap on more. They also offer wine pairings with the food, we selected the ten course menu and the wine was an additional £45. A couple of bits of crusty sourdough were the first things to arrive and whilst they challenged the teeth things were off to a good start. 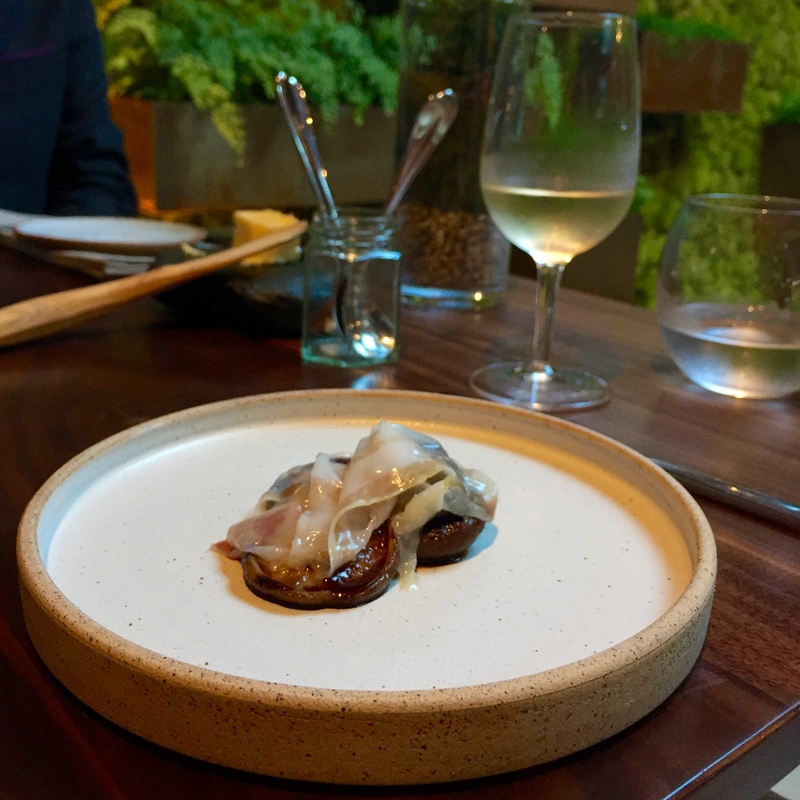 The menu proper kicked off with an ambitiously simple dish of smoked shiitake mushroom with cured pork fat. It takes some confidence to put so few things on a plate but it definitely worked for me, umami the overriding flavour. The mushroom and fat can both be a little smooth and chewy so the only note of improvement would be to add something crunchy to provide an additional texture profile. 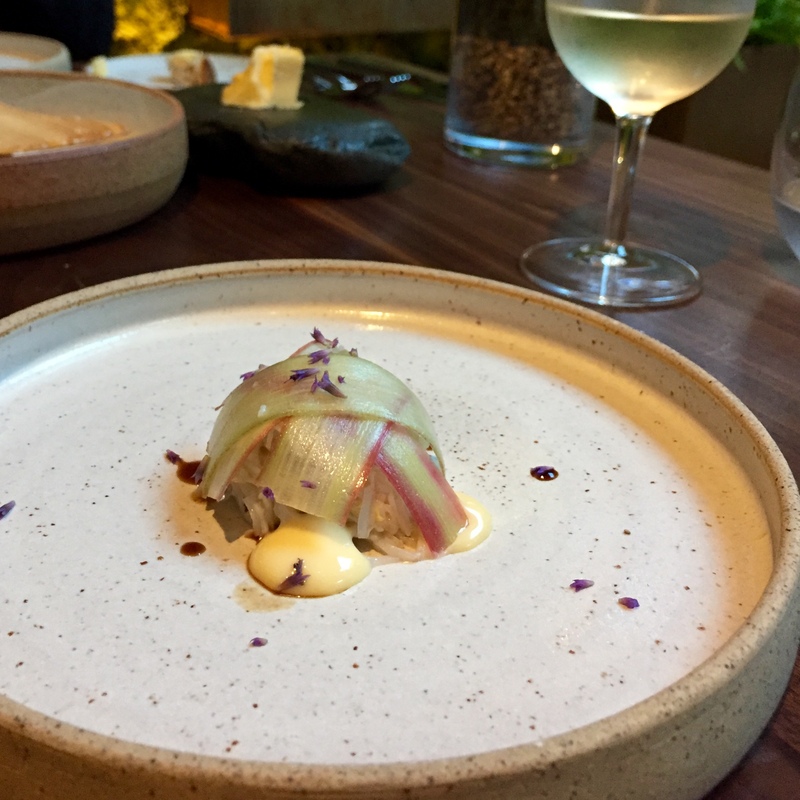 Following that was something undoubtedly prettier, a little ball of crab meat was draped with rhubarb and flanked by dots of elderflower mayonnaise and a flower unknown to me. After the triumph of flavours in the first course I question them a little here. The delicate shellfish and elderflower was enjoyable but the raw rhubarb was too harsh and its sharpness dominated my palate. There was certainly more to the next dish than met the eye. A handful of perfectly cooked new potatoes sat on top of some black fermented garlic and buttermilk sauce. The garlic flavour was so deep and intense that I wasn’t sure whether I liked it but it really grew on me, combining really well with the neutral tastes of the other ingredients. I imagine cauliflower, roasted yeast and almond doesn’t come to most people’s mind when they think about an enjoyable dinner. You’ll just have trust me on this one, it was great. The yeast intensified the flavour of the cauliflower to its earthy, nutty best and almond, employed in sugary brittle form, heighted this yet more. I’d eat it again now. Probably the best looking dish of the evening then arrived in the form of tomato and lovage. The slice of yellow tomato was nicely sweet and ripe with lots of herbs giving pockets of bitterness and fragrance . The lovage itself has a taste of celery, but grassier and more potent complementing the freshness of the tomato well. 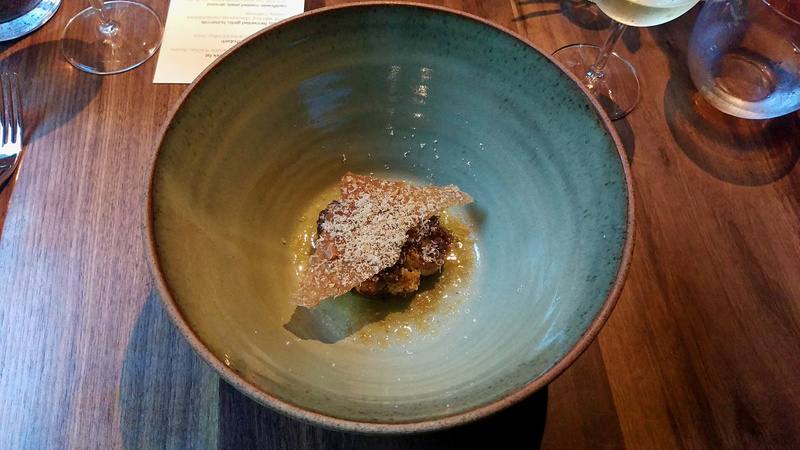 The only appearance that meat made on the ten course menu was BBQ veal. It was slow cooked and tender with a smoked cream sauce that was rich and luxurious. Some caramelised baby onions and onion puree were both well executed with a few crunchy onions that bought sweetness and texture respectively. I just didn’t actually get much of a BBQ flavour coming through? 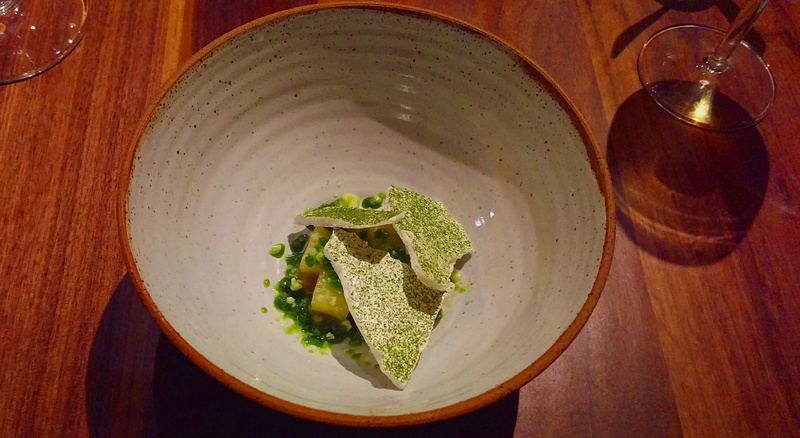 Another interesting combination kicked off the desserts in the form of apple, dill and horseradish. Cubes of compressed apple were covered in dill jus topped with horseradish meringues. The balance of these strong flavours was skilfully done and genuinely one of the best and most interesting things I’ve eaten this year. Strawberry and hay was subtle and delicate by comparison. 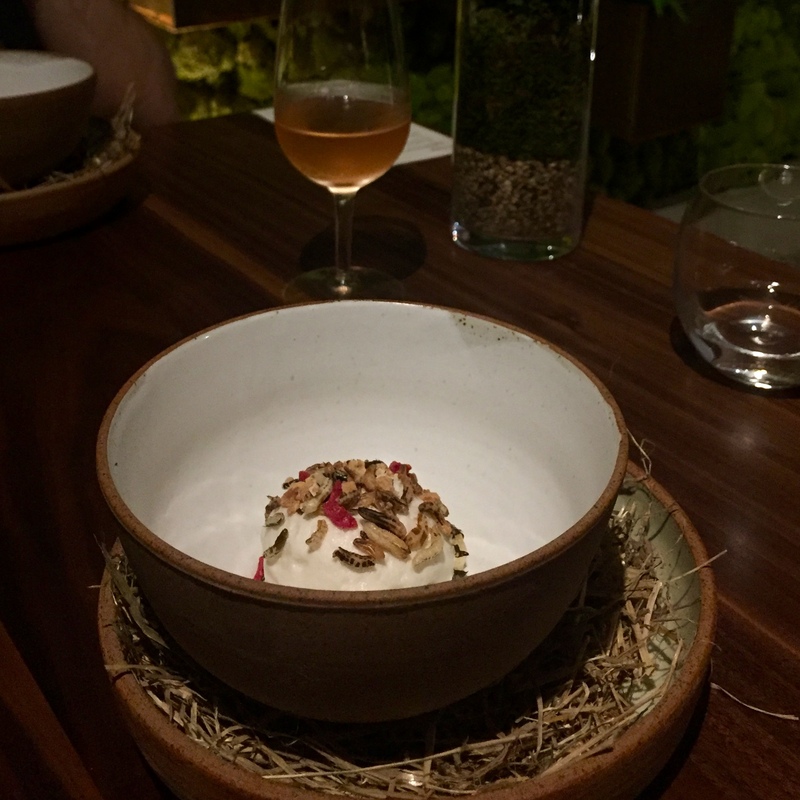 The ripe fruit was paired with some very light cream which in turn had some puffed wheat / rice for a little crispness. If anything I would have liked more hay, it was advertised as the main element alongside the strawberry on the menu. The third dessert was most reminiscent of a Sat Bains dish. Chocolate, miso banana and lime are a bold series of ingredients and they arrived in very different forms. The chocolate was a crisp or wafer as well as a quenelle of mouse, the miso a fashionable sticky smear on the plate and the main element a banana parfait. Little flecks of lime that dotted the plate with colour seemed like an afterthought but did give a literal zest to proceedings. It all worked together remarkably well, though the parfait was served too frozen and we had our work cut out to make a dent in it. The meal ended as it started with a seemingly simple plate, on this occasion of cherries and woodruff. The cherries were perfectly ripe and tasty with both cherry granita and syrup enhancing the natural flavour of the fruit. Woodruff is a herb / flower that has a fragrant almost medicinal twang but was in harmony with the fruit, another interesting and skilful pairing. I won’t go into the wine in detail, 10 courses of food is enough to describe! Suffice to say I was impressed with the pairings offered and that there was an option for each course. I have had equivalent menus where one wine is paired over 2 courses and you actually only get 6 glasses. 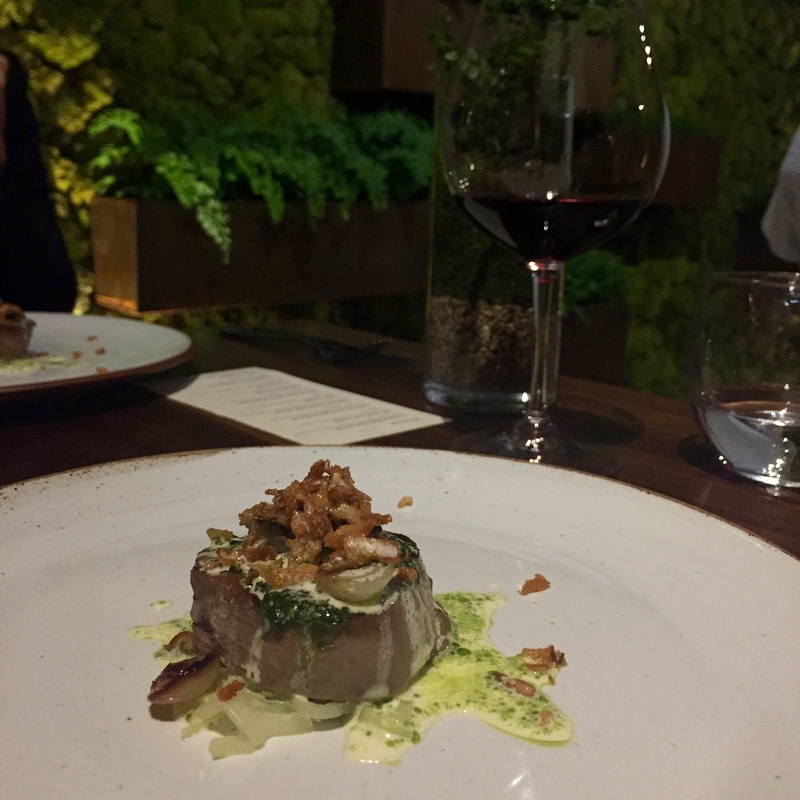 At £45 it represented excellent value, there was a beer that saved them a few £ on a glass on wine but it successfully enhanced the food so no complaints here. The menu is dominated by vegetables, a conscious choice by the chef who feels we eat a little too much meat and should celebrate the fruits of the earth more. I am going to admit to missing the odd meatier dish, I’m not asking for foie gras but when people go out and pay £60 sometimes they will need convincing when one course is a slice of tomato. There are also small improvements that could be made to the service. I might not be a diva (no comments please) but for this sort of meal having to wait very variable times for dishes and topping up your own water is not expected. I also would like a bit more engagement from the staff in describing the dishes, though I realise this isn’t too everyone’s taste. It is still early days so I am confident this will improve. Despite these constructive comments I couldn’t help but be impressed with Alchemilla. Most of all it was the distinct confidence in the style of the cooking and ambitious nature of a lot of the dishes. It has immediately announced itself in the upper echelons of the Nottingham food scene. I read that the ambition for Alex and the restaurant is a Michelin Star. In fact, when I posted some pictures on Twitter someone asked if I thought they would achieve that ambition. There is certainly enough on show for me to think that they can.